Hello! Some featured newsletters are posted here. Sign up to have them all delivered to your inbox! The writings match the work of our monthly sequences with extra off-the-mat thoughts and resources. What's around us matters. Special things around us keep us attentive to the details that matter. The photo above is the frame beside my desk. 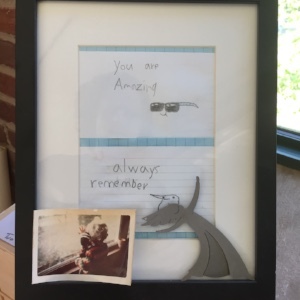 A reminder from my boy, a photo of small me, and a metal angel from my mom. I look to them when I am sitting down, when I am stuck, when I daydream. The last thing I do before I start to teach is light our candle - the candle someone from the class has provided for each month. The ritual has been so symbolic and important to me. To take a spark, an inspiration, and make LIGHT that we can share and live by. So good. Recently however, the Baltimore Fire Marshall declared no live flames in the studios. This was tough news for my ritual. After some consideration and marching through the wet woods I come to this: I invite you to help me claim our space on a daily basis. If you choose, bring an object, a picture, a postcard, a phrase or a wish on a scrap of paper, a crystal...bring what you like and add it to the front of the room before we start. It remains yours to take home or yours to leave to the class as an ongoing donation. Entirely up to you. The idea is to build our daily/monthly altar. Puja is defined as 'the act of worship'; that which makes the ordinary sacred. The ways in which we elevate our thoughts and actions and offerings. Each sequence has a purpose, a therapeutic intention. Link your offering to the sequence, to the month. Show us what it means to you. My mom knitted me a shawl years ago, and as she did she had each woman in her women's group hold it and bless it. I feel those blessings when it is around me. I have taken it to the ER, to retreats, used it to enfold sick children. It helps everything. So too the practice - our efforts and breath - will be in these objects. Bring what needs blessing and take it with you or send it off to friends in need with our well wishes. But come, draw close, make light. Shine on.